Everyone wants to look their best for the party. But Little Duck has never had a birthday before—so how better to learn how to prepare than to do what all the other animals do! The sheep trim their wool—so Little Duck trims her feathers. The pigs need a mud bath—so Little Duck quish and quashes, too. All over the barnyard Little Duck snips, slurps, squishes, and shimmy shakes herself ready until...WHOOPS! It’s party picture time—and Little Duck is a big mess. No matter—it’s not something Farmer Brown’s frosted maple cake can’t fix! In this addition to the series that began with Click, Clack, Moo, it’s Little Duck’s birthday, and the farm animals are busy getting ready. Cronin merrily describes their preparations in repeating language (“The chickens take a dust bath to look their best. They shimmy-shake, shimmy-shake, shimmy-shake clean”), but the real fun comes as Little Duck mimics each animal, getting frizzier, dustier, and muddier in the process. Lewin adeptly portrays the story’s physical comedy in swoopy mixed-media scenes that build to a “Happy Birthday to... ewww!” finale. It’s goofy birthday fun that will probably have some readers shimmy-shaking and slurp-a-lurping along with the animals. Ages 4–8. continues until Little Duck arrives, thoroughly disheveled, at his party to a chorus of “Happy Birthday to . 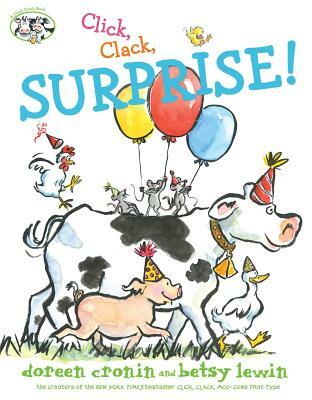 make for another fantastic read-aloud in the Click, Clack, Moo cannon. In the 11th “Click, Clack” book by Cronin and Lewin, Farmer Brown and the animals are preparing for Little Duck’s birthday party. Once the cake is baked, the decorations hung, and the games chosen, the animals focus on spiffing themselves up for the event. In turn, the duck, sheep, cat, chickens, and pigs “rub-a-dub,” “snippity-clip,” “slurp-a-lurp,” “shimmy-shake,” and “squish and squash” clean. Little Duck follows their example, ending with a dust bath and a roll in a mud puddle. Readers are likely to get caught up in the onomatopoeic fun and may be inspired by Lewin’s energetic watercolors to wiggle, shake, and strut along with the animals. VERDICT Sure to be a lively storytime read-aloud. Recommended for most picture book collections.